For businesses, choosing the best device for a new IoT solution can be one of the most challenging tasks in early deployment. There are a lot of things to consider: from how the device will connect to the internet and which sensors may work with it to the industry protocols it is capable of processing. One year ago, we launched the Azure Certified for IoT program to help customers ensure their device of choice was tested to work with Azure IoT technology. Since then, our customers and partners have embraced the benefits of bridging the cloud with IoT devices together. With their enthusiasm, we have grown Azure Certified for IoT into one of the largest device ecosystems in the industry, with more than 100 partners and 175 different devices already in the program. Today, we’re announcing the Azure Certified for IoT device catalog, a step forward in helping customers on their IoT journey. 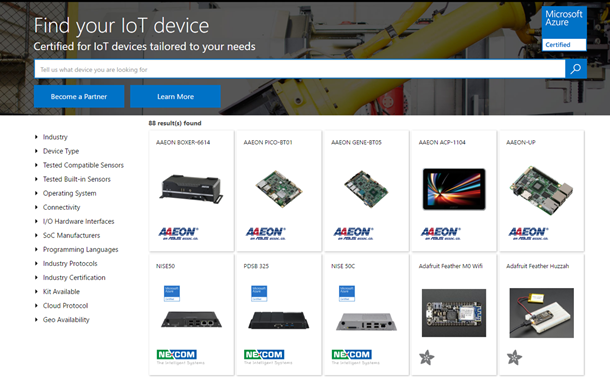 The device catalog is available to anyone looking for the best device for their needs from any Azure Certified for IoT partner. If you’re currently an IoT customer, the Azure Certified for IoT device catalog will facilitate the search of the right device or family of devices. You can now refine device search by multiple criteria, get instructions on how to connect to Azure IoT Suite and Azure IoT Hub, and even request a demo of the device from the manufacturer. For example, looking for gateways that connect to the Azure cloud via Wi-Fi using Java code over MQTT will be a matter of a few clicks. And, if you are looking for something you can’t find, you can submit a request through the portal and our team will do our best to include it. If you are an IoT device manufacturer, the device catalog provides an opportunity to give your technology global exposure, opening new markets with customers already using Azure IoT solutions. Microsoft will also provide metrics on your device’s interest and performance so you can grow your business. In addition, to help you differentiate and showcase your device, we are offering $3,000 of Azure credit to the first 25 partners that enroll 10 devices or more in the catalog. You can start enrolling your device on the catalog by visiting www.catalog.azureiotsuite.com/partner. We are excited about the possibilities that this community will unlock and can’t wait to see the solutions that our customers and device manufacturers build together with the power of Azure IoT. 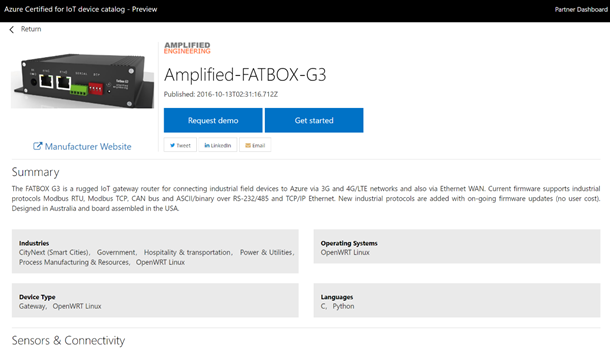 Get started finding your IoT device today by visiting www.catalog.azureiotsuite.com.